"I firmly believe that the draft withdrawal agreement was the best that could be negotiated," May told reporters in London. "This is a decisive step which enables us to move on and finalize the deal in the days ahead." Sterling traded 0.2 percent higher at $1.2999 as of 2:22 p.m. ET after breaking below $1.29 earlier in the day. The British pound rebounded from its lows of the day on Wednesday after Prime Minister Theresa May said she had obtained enough support for her proposed Brexit deal to move forward. "I firmly believe that the draft withdrawal agreement was the best that could be negotiated," May told reporters in London. "The choices before us were difficult," May added. "But the collective decision by Cabinet was that the government should agree the draft withdrawal agreement and the outlying political declaration." "This is a decisive step which enables us to move on and finalize the deal in the days ahead," May said. The deal reportedly keeps the UK within the customs union of the EU for an unspecific amount of time. The draft deal also includes commitments over UK citizens' rights after Brexit and a proposed 21-month transition period after Britain's departure on March 2019, the BBC reported Wednesday. 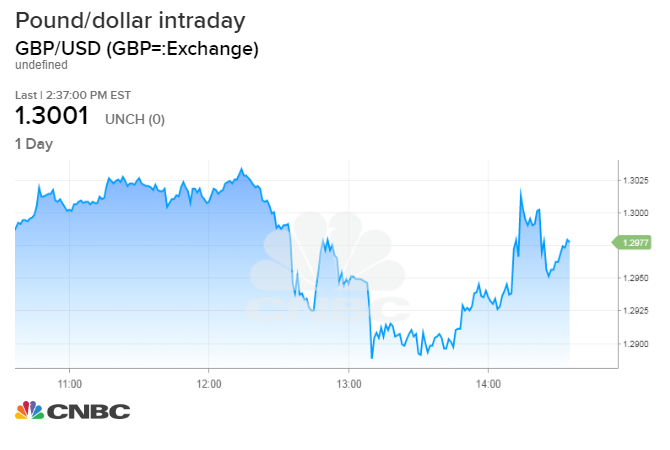 The pound first started falling earlier in the day after the UK police minister said May would not deliver a statement to the media regarding the country's divorce from the European Union. The currency quickly recovered those losses after the BBC and Sky News reported that May would in fact deliver a short statement on the matter later in the day. But the currency later fell to its lows of the day after a BBC correspondent reported that UK officials are considering a "no confidence" vote on Thursday as "Brexiteer anger" rises.